← Week One of NaNoWriMo over, how did you do? Trying to get my NaNoWriMo groove back. Week two of NaNoWriMo done and dusted, how did you do? Me? Well, I transferred some old articles from an old blog to a new one, plus I worked on my new Foodie blog (amazed how popular it’s getting already). Oh, and I managed a few penpal letters, but am still behind on those. Sadly, that’s about it writing wise. Mind you, this is not for the lack of trying. This week just happened to be a week I had to take my well-worn Author badge off and get back into my Parent uniform. Some of you know I have a quirky and rather special son, Horde#3. Well, this week we started the assessments to help us figure out the level of his special quirkiness. He is still who he is and this official label will just help us ensure he gets the right sort of support to help him cope with life and a world that he’s not quite wired for. But by god the amount of bloody paperwork that you have to go through to do it is annoying! And so that is how I spent a lot of my week. In waiting rooms, filling out forms, emptying our near depleted bank account into someone else’s due to the lack of funding and support for this sort of thing… but it’s all been worth it. It has just meant next to no writing. Oh, and I did win the latest round of Mother of the Year with him on Thursday by combining his all-time favourite thing with his all-time favourite food… by taking him to a sushi train. 😉 And yes, I have now set a new precedent and it will be demanded each time we go visit his new Psychologist. Oops! Adding to my already busy week, my only ‘free’ day wasn’t so free as my eldest child, Eldest Horde, had a student free day on the Wednesday. And I would much rather go do something with her than sit and write – sorry fans, my kids come first – and that day was a write off (ha ha) too. So we went to a local Wildlife park we have annual passes for as she is our animal lover and wannabe zoologist. Side note – All my kids are all above average in the intelligence department… I think I’ve mentioned this before? And Eldest Horde has wanted to be the world’s leading expert in Sifaka since she was roughly five years old. She turns ten in January and simply absorbs information on animals. When she runs out of work in her class at school and has to wait for everyone else to catch up (near daily) she works on research projects about animals. The Amur Leopard had been given a mention in the past and she wants to start raising funds and awareness for them. Right now she is working on a report about the Inland Taipan. Yes, the world’s most venomous snake and a near neighbour to our Adelaide Hills. She’s found a picture of one with a Santa hat photo shopped onto its head and wants to use that as this year’s Christmas card… Yeah, no. So! She and I went off to Cleland Wildlife Park and our first stop was to go visit the Inland Taipans they have there as, still being a child, she wanted to tell them all about her project. As you do. It was a lovely morning there; the native plants were all in bloom and absolutely filled with bees. Such a happy thing to see when bees are having such a hard time in our over polluted world right now. It was a warm day so there were skinks skittering about everywhere too. The little splendid wrens and local finches were dipping and diving to catch bugs mid-flight all around us. So you can see there was a lot to fuel my Writer’s mind even if my hands were still. 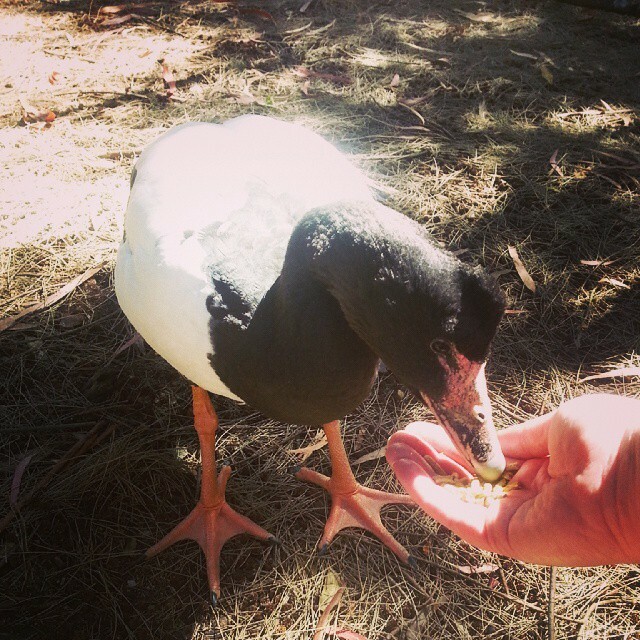 I even got to feed one of my favourite water fowls, the Magpie Goose. Still being a Darwin girl at heart, I miss these prehistoric looking critters that roost in trees at night. So was happy to get to feed one, and take a snap shot. Yes, I am going Instagram crazy these days. I blame this whole author branding thing. But I have also noticed a blog with pictures gets a better response than one without. Go figure. Me feeding a Magpie Goose at the Cleland Wildlife Park. Wednesday afternoon met with a new ‘dilemma’. My middle child, Middle Horde, had left her glasses at home that morning and so when I was picking Horde#3 up from pre-school at lunch time (half days on Wednesday) I took her her glasses. She immediately asked to come home too as Horde#3 was coming home, Eldest Horde was at home, she felt left out. Sucker that I am, I gave in and off we all went. Eldest Horde and Horde#3 had a pre-arranged afternoon at my folks, so Middle Horde and I came home and played computer games and board games together. No writing. I did mention my kids come first, right? 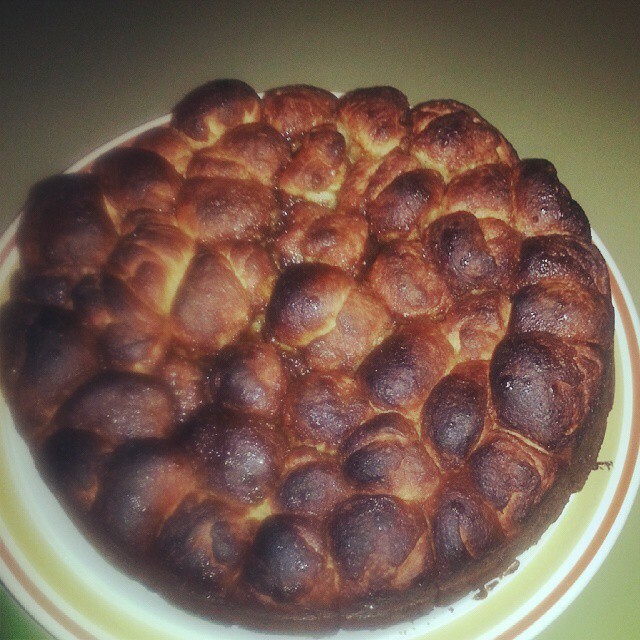 Then more appointments and more paperwork and here I am today with next to no actual writing done, but some decent blogging, penpalling and baking done – I made monkey bread. Seriously, you need to follow me in Instagram to see this stuff! Monkey bread. Foodie fans, so sorry… but it did indeed contain wheat and dairy. Eeep! My bed, laptop, note pad, glasses and a few of my beloved books currently helping me in my research.